Independent U.S. distributors Synapse Films have announced that they will release on Blu-ray Harold P. Warren’s Manos: The Hands of Fate (1966), starring Tom Neyman, John Reynolds, and Diane Adelson. Sourced from a brand new 2K restoration, the release will be available for purchase on October 13. MANOS: THE HANDS OF FATE, the sole directorial effort of Texas fertilizer salesman Harold P. Warren, perplexed even the most jaded Drive-In audiences and was deemed by many “the worst movie ever made”. Nearly lost, the original 16mm Ektachrome film elements have been finally unearthed and lovingly restored by Ben Solovey to create the definitive version of this accidental masterpiece. There’s no other movie like MANOS… now in HD with picture and sound unseen since 1966. As planned, I’ll be receiving backer discs after they are manufactured, but before they arrive in stores. Your Blu-ray or DVD will be shipped immediately after I get them. The exact ETA will depend on your location. I’m still taking updates from backers concerning changed addresses, and will continue to do so until the discs arrive for shipment. It’s important to note that Kickstarter has no method to change your survey results, so you’ll need to use the messaging system to contact me directly with address updates. True to their word, the Synapse discs will be region free, capable of being enjoyed anywhere in the world. The “Grindhouse Edition”, a Blu-ray exclusive extra, comes from an unrestored 2K transfer directly from my 16mm theatrical print, the same one used for the Rifftrax Live Show (they color corrected it on their own, so don’t expect the exact same image). Unlike the restored version, the Grindhouse edition will be released under a creative commons attribution license, free to use and remix as you see fit. DVD-only backers won’t necessarily be without the Grindhouse edition for long, though… more on that soon. Our partners in the distribution of Manos, Synapse Films, has begun talking publicly about the disc release. Announced so far as extras are the audio commentary from Jackey and Tom Neyman, the documentaries (one long, two short) that I produced with Daniel Griffith at Ballyhoo Motion Pictures. The retail release of the disc is determined not only by the length of this quality control process, but by when the company’s resources will best support the mass duplication and distribution of the final product. This is an exciting time, though I’m only slightly involved at this point. I’ll share what information I get as it arrives, and the most immediate updates will be found on our Facebook page. It wasn’t until the day I interviewed Jackey Neyman Jones and Tom Neyman in Oregon that I flipped over one of the few surviving set photographs and saw the name “Anselm Spring” stamped on the back. Despite the number of names (both real and fake) used to pad out the credits, his does not appear on the film. Just who was this person, and how’d he end up being the unknown set photographer on Manos: The Hands of Fate? A quick internet search did, in fact, yield one German-born artist and musician with that name. What’s more, a very talented, prolific, wanderlust-y artist. An artist that lives today on top of a mesa in Utah, in a house he built with a wood fired stove in one room and a modern recording booth in the next. His studio, as I would find, was a proving ground for bold mixed media pieces large enough to cover most walls. The question still remained: how’d this future iconoclast, this eccentric-and-proud man of the world, get from Germany to the set of this film with a Pentax Spotmatic in tow? The answer to that question takes us back to the Cold War. As the West (and with it, West Germany) developed a new arsenal of air defense weapons, many were tested in the field at El Paso’s Fort Bliss. 23 year old Anselm Spring was stationed there as an interpreter when an acquaintance, the owner of a local photo shop, recommended him to the production. Seeing in Mr. Spring both a germ of talent and the prospect of free labor, Harold Warren brought him into the Manos family. Anselm’s assignment wasn’t easy: with the bulk of the movie filmed at night, a limited number of harsh movie lights on the set were his only source of exposure. After filming wrapped, Anselm turned in the best photos to the production company- none of which satisfied him, he says- and began to experiment with the leftovers, carefully charring slides with an open flame to create dramatic swaths of decay. Though many of his set photos would ultimately be lost, two “rejects” would survive, repurposed and submitted on a whim to Popular Photography Magazine. And so, images of Torgo and The Master found themselves in Anselm Spring’s first published work… though when we first talked, he couldn’t be sure which issue. 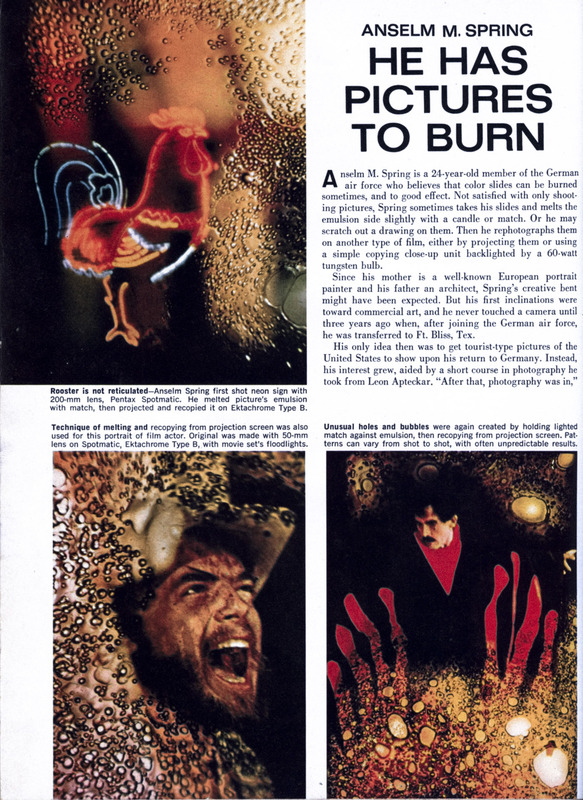 Long story short: I found myself in the public library on a long California afternoon, jolted by the familiar faces of Torgo and The Master flashing by in negative on a microfilm reader, flanked on each side by cute vintage camera ads. Above them, a headline: “ANSELM M. SPRING: HE HAS PICTURES TO BURN”. One trip to eBay later, and I had the full-color April 1967 issue in my hands. Though he likes to insist that the film has little to no artistic value, Anselm seems to regard with affection that chain of events in 1966 that led him to his favorite means of expression. He has since updated his biography on his website to include the film- a meaningful acknowledgement from an uncompromising artist. This is the one interview that I wasn’t sure I’d get to do. The mysterious Diane Adelson (“Mahree” is her middle name, which she elected to act under) went on to a long modeling career in Europe after playing (but not voicing) Margaret. Today, she values her privacy and only occasionally uses the internet. Living comfortably in Colorado and dealing in antiques, she has only more recently made herself known, traveling to Nashville for the Rifftrax Live Show and reconnecting with the friends and family of the cast. Once again, we owe Jackey Neyman Jones a debt for her invaluable, and tactful, help in introducing us to Diane. Not only did Diane sit down with us in her home for an on-camera interview over the course of a day, she proved herself to be a witty and fascinating individual. Her interview paints a picture of a precocious young woman possessing a surplus of integrity, who approached Manos as she did everything else: with a sense of adventure, a committed attitude, and a healthy amount of humor. Despite the fact that Diane did not want to make a career out of acting, and even though her role is very, very underwritten, her game approach to some of the most bizarre material in Manos never fails to leave a strong impression. I’m glad we’ll be telling her story. Something you’ll notice if you’ve previously watched Manos on video is the very abrupt beginning of the film. While the MST3K version starts with a shot of the family driving by in their car, the public domain version (which likely originated from an independent VHS distributor’s 16mm transfer) starts a few moments later with the car already parked on an overlook. Neither of these is in fact the beginning of the film, although the MST version comes closest. In fact the first shot of the film, present on both the work print and the uncut release print, is a fade up on a view of 1966 El Paso from the overlook, followed by a pan right that takes in the full scene and stops on the city. It’s accompanied on the release print by an earlier start to the musical score. Not an incredibly startling revelation out of context, but it gives us a bit more of that distinctive musical score to enjoy, and it does confirm that the movie has no opening credits, no copyright information and not even a production company logo before the title card several minutes in. Today would have been the 72nd birthday of John Reynolds, the one and only “Torgo”. Right from his first close-up, Reynolds (then 25) is one of the main reasons this film remains such an object of fascination.